How much does the New iPad REALLY cost? Buying an iPad is considered as a status symbol for many. For some, it’s a necessity. And they go out of the way to procure one. The long line of customers before the Apple store in China, waiting to buy the New iPad is a live proof about the frenzy Apple products bring with them. The New iPad, known to the world unofficially as the iPad 3, didn’t have much breakthrough changes as expected, from its predecessor, the iPad 2. With retail price tag of US$ 729 (32GB), is the new iPad worth the money? Is the price an exaggeration or could it have been cost a bit less? The breakdown analysis by iSuppli will help us here. The new iPad, equipped with 32 Gigabytes (GB) of NAND flash memory and 4G Long Term Evolution (LTE) wireless capability, carries a bill of materials (BOM) of $364.35. Bill of Materials cost refers to the total cost of all the hardware components involved. When the $10.75 manufacturing costs are added in, the cost to produce the new iPad rises to $375.10. The BOM of the 16GB 4G LTE version amounts to $347.55 and the 64GB version is estimated at $397.95. 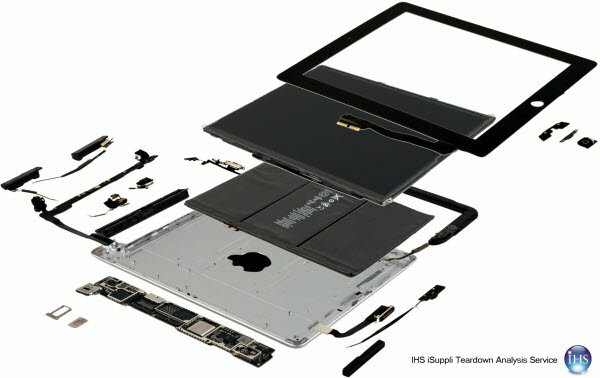 The very lowest-end version of the new iPad, with 16GB memory and no LTE, carries a combined BOM (Bill of Materials) and manufacturing cost of $316. The highest-end model, with 64GB memory and integrated LTE, has a total BOM and manufacturing expense of $408.70. Without LTE, the figure narrows down to $347.55 and $397.95 for the 16GB and 64GB new iPad respectively. 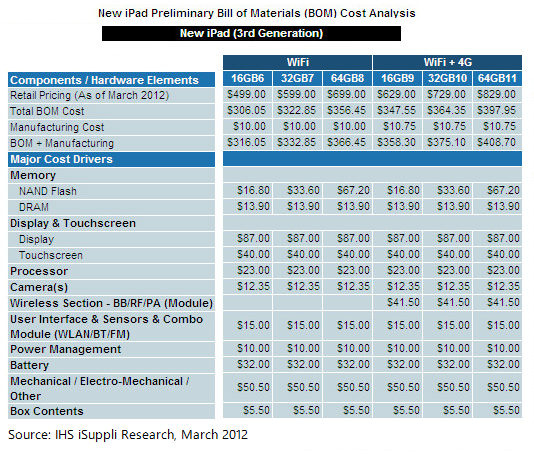 Clearly there is a neat difference of US$ 250-300 between the Retail Price and BOM of the new iPad. But it’s pretty evident that this BOM cost only represents the native manufacturing cost of the hardware components, whereas the software, packaging, marketing, distribution, etc are extra and adds up to the final cost. However, every purchase of the new iPad nevertheless, ensures that a hefty profit is deposited in Apple’s account. Want to know how much does the new iPhone 4S actually costs? Head over here. Go here if a Nokia Lumia 900 cost teardown interests you. Nice job breaking this down. I dispise Apple – this is the biggest consumer rip-off in this decade. is it really worth consumer support when price fixing is evident. If perhaps, in Canada iPad is near $1000 after taxes, Apple clearly takes half for profit. I do enjoy the iPod Touch 4 and certainly going to weigh my choices the coming months for tablets. Apple products are for iDiots. While I dispise Microsoft, the system is more customizable. Apple locks everything down & charges more.